On June 18, we bid farewell to Rome, taking advantage of one last yummy, free hotel breakfast with the great cappuccino. The three-hour bus ride from Rome to Positano featured a stop at Autogrill. Autogrill, Europe's answer to Stuckey's (minus the charm), delivers dirty bathrooms with no seats on the toilets and $4.00 (in American money) Coca-Cola Lights (also known as Diet Cokes in America). Flat stretches of highway between Rome and Naples were punctuated by occasional hilly villages with pretty old buildings and one modern shopping mall. Naples (the city of Chad's birth) spilled over with many tall apartment buildings for as far as the eye could see. Then the terrain took on a hilly, curvy nature with narrow lanes and switchbacks. Hello, motion sickness! We started to see the Tyrrhenian Sea and lovely, ancient cottages stacked into the hillsides, blanketed by Bougainvilleas and other lush flowers and greenery. I forgot about my motion sickness, distracted by the beauty. Hello Positano! Hello great hotel on the beach with lovely views and a private balcony for each room. Hello free welcome drink. Hello beach. Hello yummy pizza and gelato just downstairs. Yes, let's stay a few days. On June 19 we ventured out on the tour bus to see a few sites: La Basilica del Crocisisso of Amalfi - a grandly adorned church, Gardens of Villa Cimbrone in Ravello - breathtaking views well worth the steep hike, and Pompeii. Honestly, I could have skipped Pompeii. It was hot and dusty. The same lava dust that buried everything, and possibly contributed to the suffocation of Pompeii's former residents, left a fine layer on me that day. Our tour guide (not our beloved Elsa, but a local guy) was a pompous jerk. The presence of lead pipes carrying water around Pompeii and the keystone arch architecture were impressive feats of technology for that time in history, but the "art" featured advertisements and bawdy scenes of erotica -- kind of like media today. Yes, very advanced civilization. Did I mention the heat and dust? We ran straight to the beach after our field trip to dunk in the cool sea water. 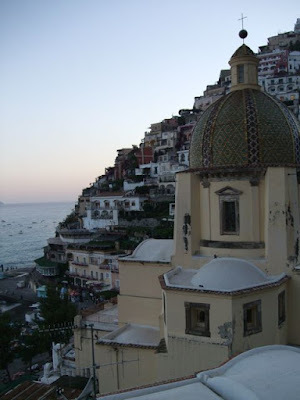 The Amalfi Coast region is known for its lemons, which vary in size from softball-sized to cantaloupe-sized. With this abundance of lemons, the locals cook up a strongly potent alcoholic beverage called limoncello. They package it in cute bottles and sell it as souvenirs. We tried limoncello one evening after dinner. Syrup-sweetness, tartness and high alcohol content yielded involuntary pucker-faces from both of us. June 20, our last full day in Positano, Chad and I skipped the planned ferry trip to Capri in favor of enjoying the beach and the beauty that Positano offered. Aaaahhh... relaxing and refreshing.